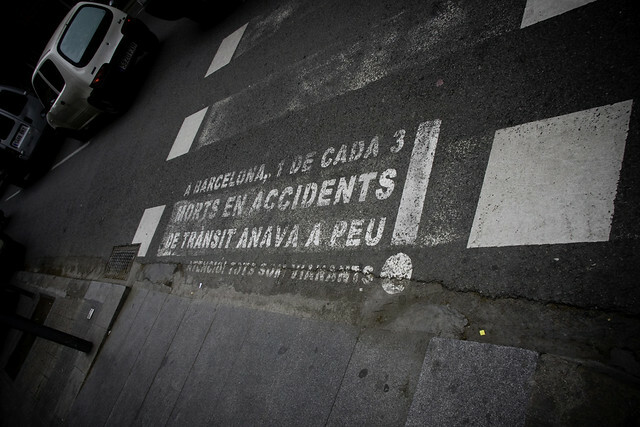 You see these warnings aimed at pedestrians in many places in Barcelona. It is, of course, a classic "Ignoring the Bull" tactic that places the responsibility wrongly on the vulnerable traffic users. I learned, however, something that wasn't THAT suprising. These warnings are sponsored by an automobile organisation and the city actually lets them paint them on the streets. There are no corresponding warnings for motorists. 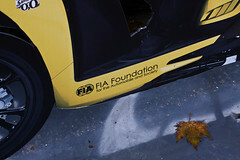 The warnings are sponsored by FIA Foundation - slogan: "For the Automobile &amp; Society". According to their website, the "FIA Foundation was established in 2001 with a donation of $300 million made by the Fédération Internationale de l'Automobile (FIA), the non-profit federation of motoring organisations and the governing body of world motor sport". An automobile organisation promoting automobiles "for society" is a bit spooky. A well-funded one is downright scary. 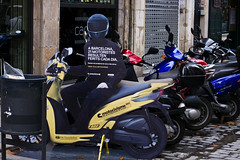 The FIA Foundation also sponsors these warnings to scooter riders in Barcelona. They would rather see them in cars, I suppose, and not denting up the paintwork of FIA's target group. FIA Foundation are well-known for their helmet promotion as well. They have a campaign together with Inter American Development Bank and Sesame Street to promote bicycle helmets - As part of the Global Alliance on Road Safety, the IDB joins forces with Sesame Street and FIA Foundation to raise awareness among children and youth on the importance of helmet use to prevent fatal road accidents. There is also more taming of pedestrians who might get in the way of car traffic. Ignoring the Bull, indeed. I've been writing about this sad tendency of "safety campaigns" to speak to the vulnerable traffic users instead of the ones that do the killing and maiming for a while. There are many examples of ignoring the bull but very, very few of campaigns directed at motorists. 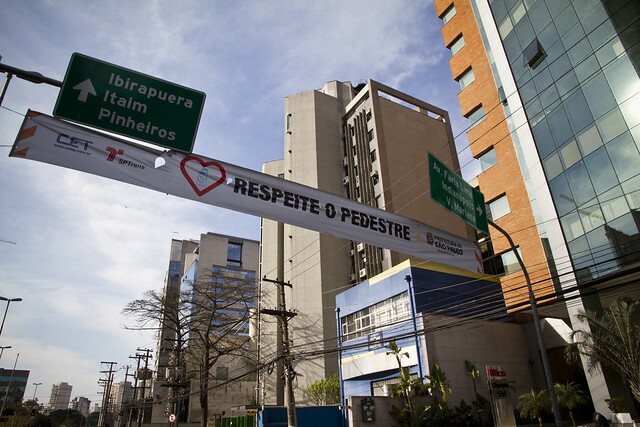 In Sao Paulo, last month, I was pleased to see a campaign with the focus in the right place. These banners were all over the city. Respect the Pedestrians. 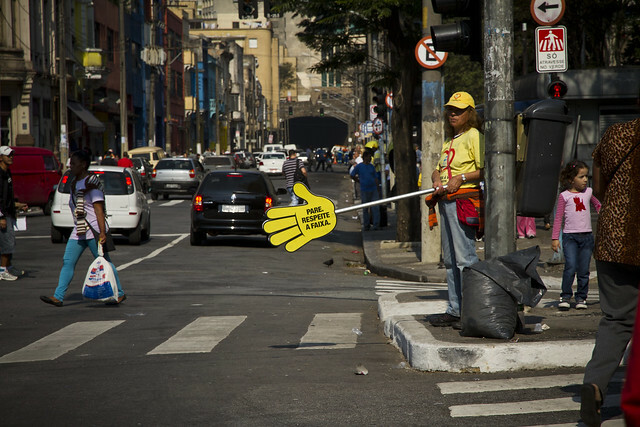 In the city centre, these hands were used when the crossing light was green for pedestrians, to make motorists aware of them. Sure, not an optimal way to make a liveable city, but it is at least an example of speaking to the problem, not the victims. The HeSO's (Health and Safety Officials) in Denmark may not get funding from automobile organisations, but they certainly adhere to the same car-centric doctrine - High Season for Danish Fear Merchants.